Imagine standing a load of dead trees on their heads and ‘planting’ them in your garden. Does it sound like a good idea? or even a sane one ? Yet yet its been done by all sorts of people on for the last 150 years and more, including most famously, Prince Charles. But not everyone sees the attraction of heaping up old tree stumps and making them a garden feature. ‘When the Duke of Edinburgh first laid eyes upon the stacked-up tree roots of the Highgrove “stumpery”, he turned to Prince Charles and said, “When are you going to set fire to this lot?’ (Andy Sturgeon, Guardian 16th Dec 2006). Anyway, having tried to make a small version in my own garden, and realising how difficult it is both as piece of design work but also simply as a physical task – tree stumps are big, cumbersome and extremely heavy – set me thinking about the origins of this rather strange garden feature. Like most posts that I’ve written, there’s more to the story than meets the eye, and I found myself following all sorts of byways and sidetracks, which will doubtless lead to more posts soon! But now read on to find how a painter who specialised in sea pictures, a fox hunting poet and a wealthy industrialist devised this quirky but charming Victorian oddity…and maybe where they got the idea from in the first place. 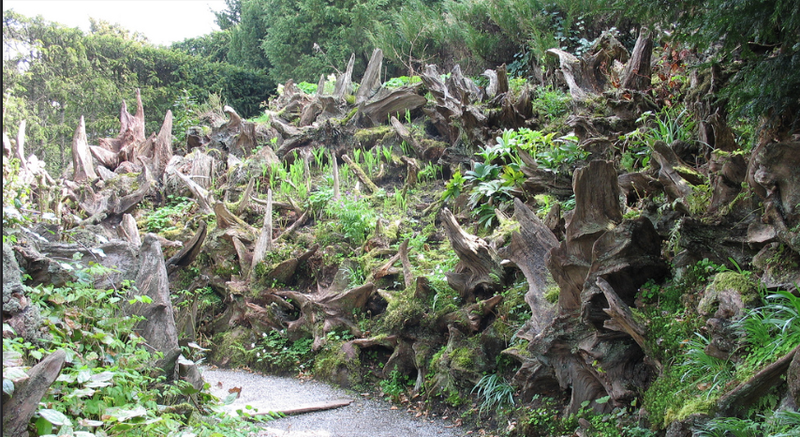 The first pile of tree roots actually to be called stumperies are generally thought to be those at Biddulph Grange in Staffs and its quite close neighbour Arley Hall in Cheshire. They both date from the 1850s. 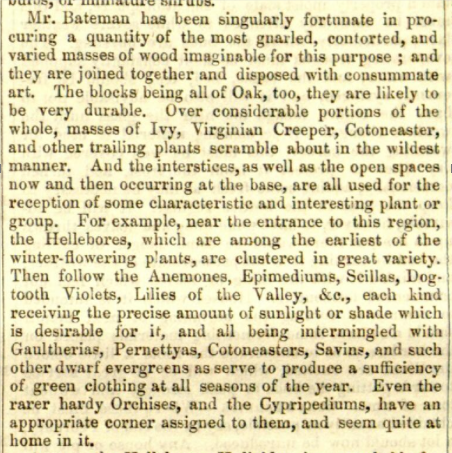 In October 1856 Gardeners Chronicle in an article on Biddulph refers to “a rustic root garden” and a continuation piece in December elaborates the description at considerable length and uses the term ‘the Stumpery’ for the first time. 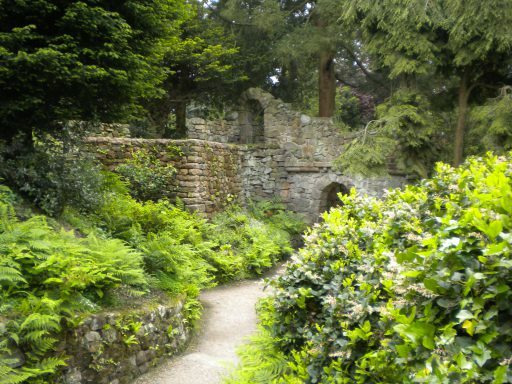 The Biddulph Grange stumpery was clearly a deliberately planned ‘architectural’ construction, rather than just a random heap, and was designed as a space for particular plants to grow in, on and over. Even today it is impressive, although after 160 years of natural decay not as high or angular and jagged as it was when it was first constructed. 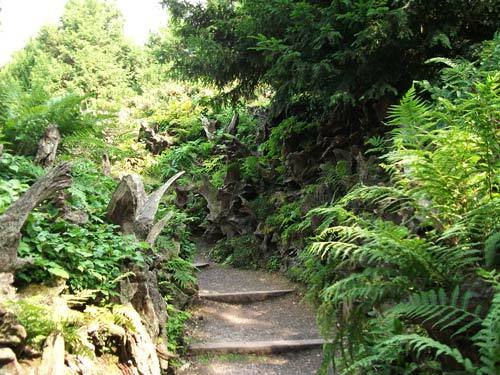 The Chinese area of Biddulph “is approached on one side by steps and a steep inclined plane through a rude cavern-like tunnel,… And on the other side… Through very well arranged and characteristic root-garden”. 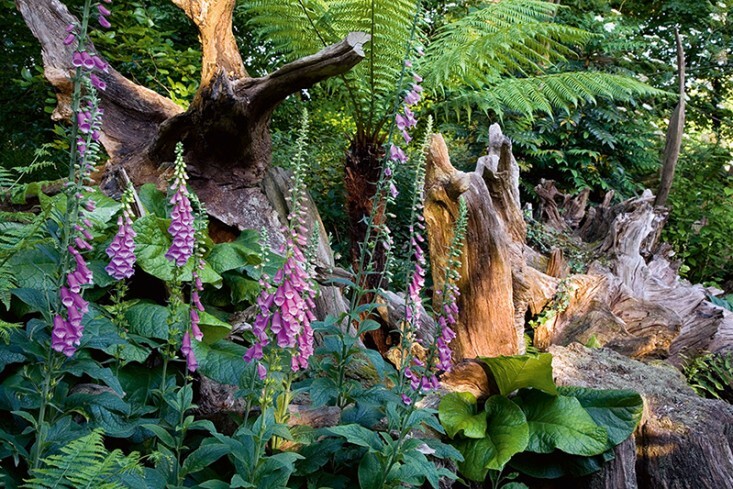 Obviously there is a close link between constructing something as unusual as a stumpery, and the Victorian craze for ferns and fern collecting – pteridomania – but is there more to it than that? 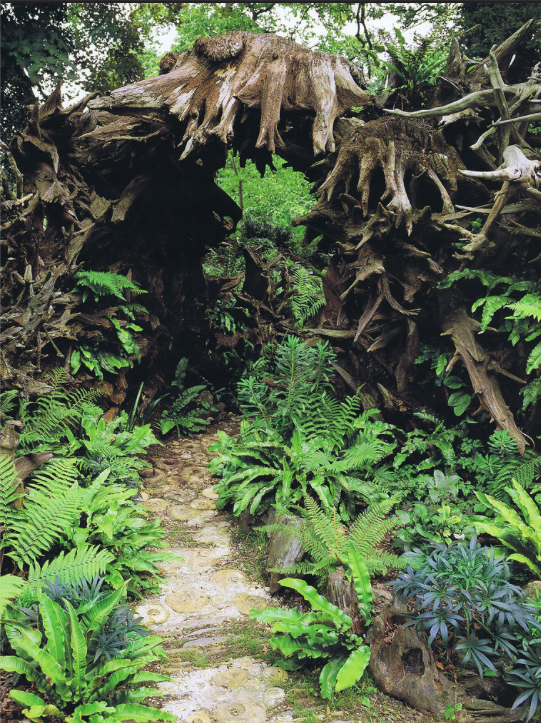 Is there perhaps some connection, theoretically or intellectually as well as physically between the strange fantasy of the stumpery & Victorian images of China or indeed any other part of the garden? 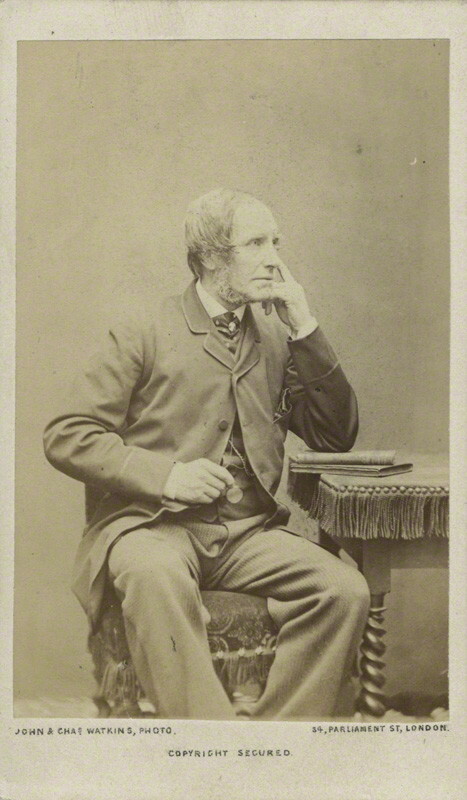 It’s important to know that Bateman and his wife probably did not design the garden entirely on their own but enlisted the help of Edward Cooke who had paid his first visit to Biddulph in 1849. 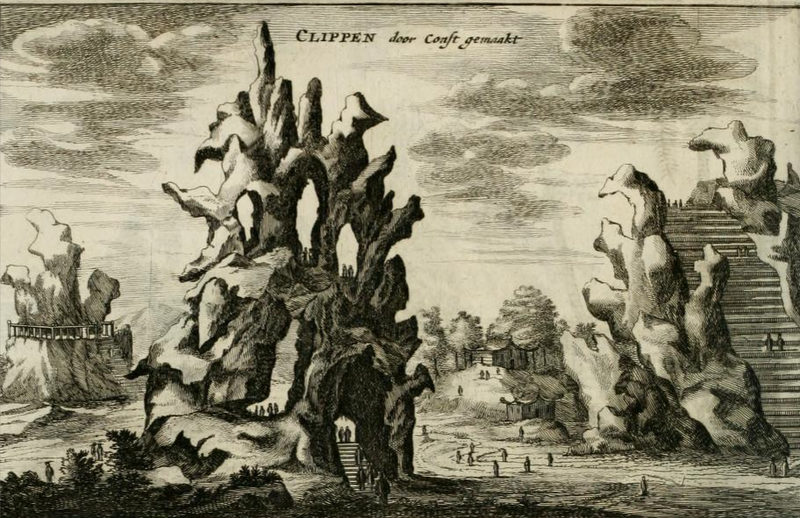 Cooke is responsible for many of its main architectural features, probably including the Stumpery and the rockwork formation known as The Glen. Cooke is a wonderfully Victorian character and will be the subject of another post in the very near future. A man of many talents, his income came mainly from painting marine pictures, but he also dabbled in garden design on the side. Of course Cooke was not creating a new art form, or something in a vacuum. A recent conference in Oxford showed the roots [!] of rusticity in the English garden going back at least to the 16thc,with a long interest in rough woodwork structures, rockwork configurations and other unusual landforms. 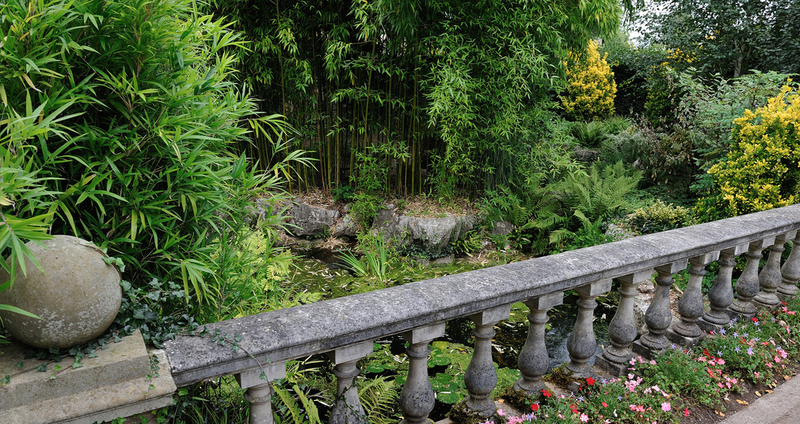 [Rustic Nature and Artistic Rusticity, Oxford Garden and Landscape Seminar, March 2013 http://www.mfo.ac.uk]. 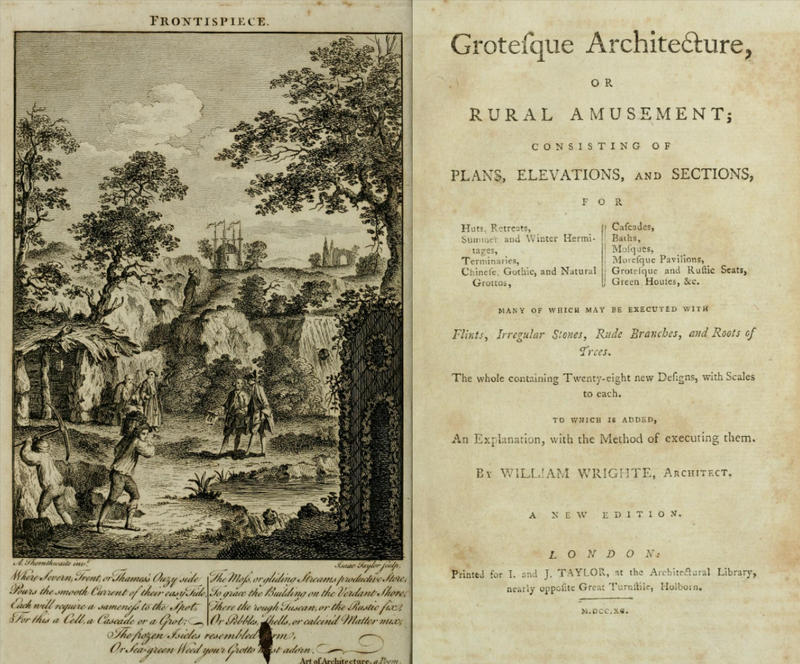 By way of example, the mid-18thc architect William Wrighte published Grotesque Architecture full of ideas for rustic wooden buildings, “many of which may be executed with Flints, Irregular Stones, Rude Branches, and Roots of Trees.” In his accompanying notes it is clear that structures using branches and roots were usually associated with hermits. Unfortunately I can find almost nothing else about Wrighte so its difficult to now where he got his ideas from. 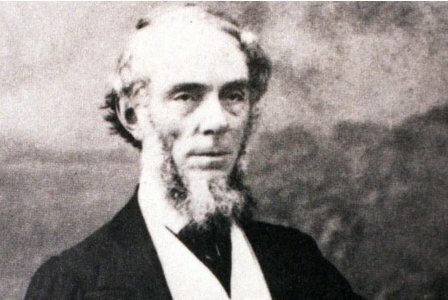 But in the process of trying to discover more about him I found his near namesake: Thomas Wright. 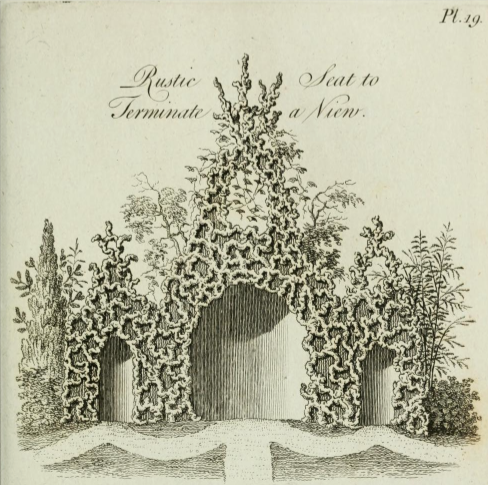 Thomas was a mathematician and astronomer who also designed gardens, and was interested in the rustic, grotesque and outlandish, publishing the first two parts of a planned Universal Architecture in 1755 and 1758, on Arbours and Grottos. And where did Wrighte and Wright get their ideas from? That probably deserves another post but lets just say it seems to have been a quite esoteric mix of ideas and sources, involving Druids, freemasonry and perhaps even Egyptian mysticism. 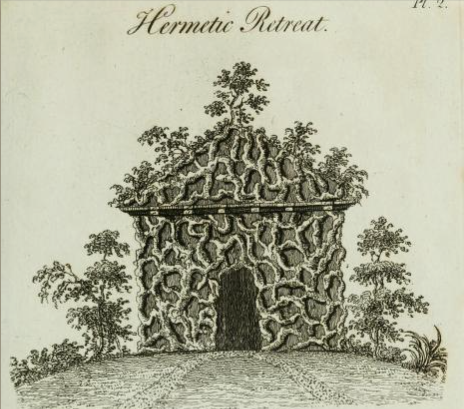 [For more on the strange links between Druids and Gardens look at the post on Thomas Stukely]. So it would be interesting to know if Cooke or Bateman were freemasons or perhaps owned either of those books. 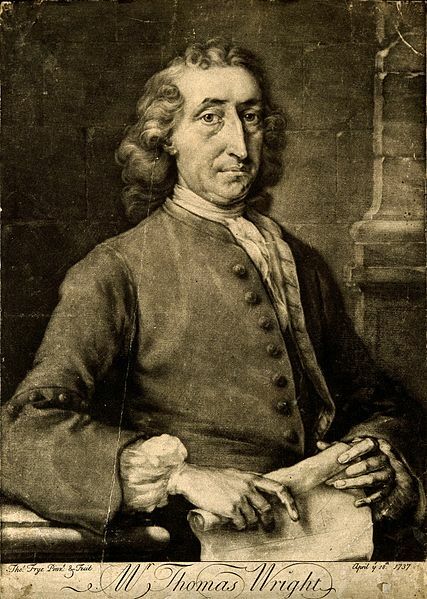 If you want to investigate for yourself, a good starting point is Judith Preston’s article about Thomas Wright, “A Polymath in Arcadia“. The whole concept of the rough and rustic also fitted in well with the rise of interest in the romantic but wild and savage landscapes and garden features beloved of Richard Payne Knight and Uvedale Price. 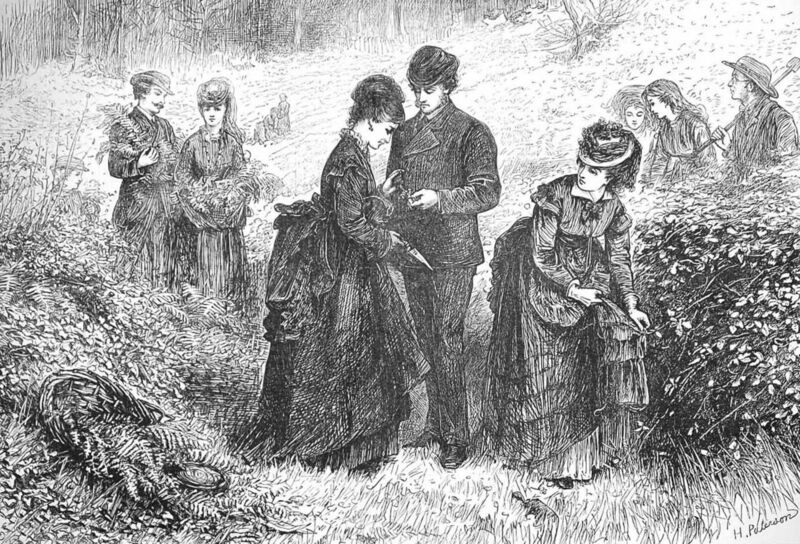 It had been picked too by ‘politer circles’ because Jane Loudon included a long section on ‘rootwork’ in The Ladies Companion to the Flower Garden of 1840. So perhaps it was a combination of many factors that influenced Cooke and Bateman. 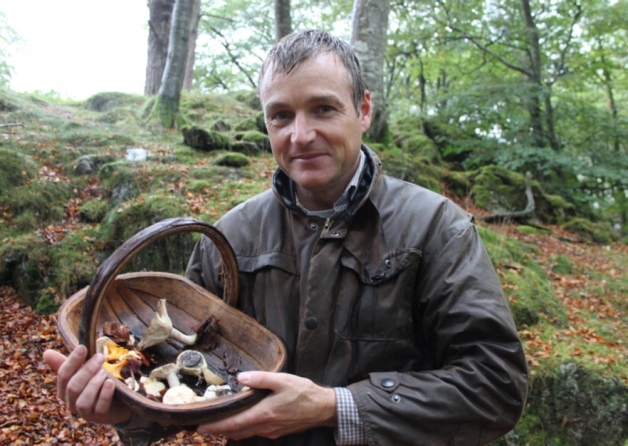 However the question why the two earliest recorded stumperies are only 25 miles apart is easier to answer. James Bateman’s wife Maria was the sister of Rowland Egerton Warburton, the owner of Arley Hall, (and the fox-hunting poet of my introduction). Rowland and his wife Mary arrived at Arley as newlyweds in the early 1830s. “From what we know” says their descendant, the present Viscount Ashbrook, “the garden was mostly their own design. Both were very artistic people and knew exactly what they wanted to achieve.” They rebuilt the house and set about redesigning the gardens. But of course they would have seen what Bateman was doing at Biddulph, and we know that Cooke visited Arley as well. 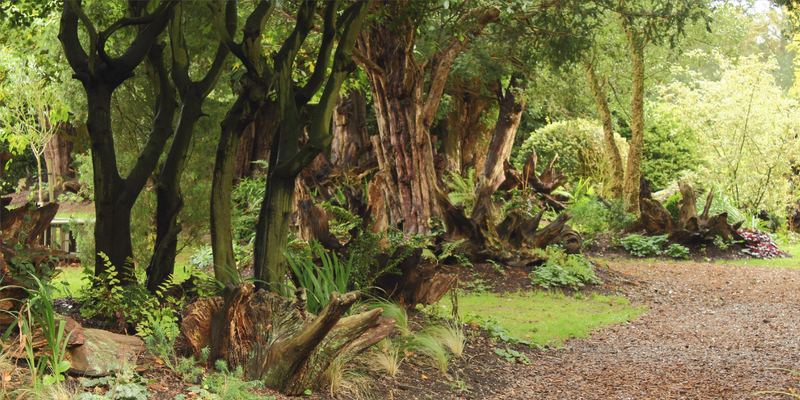 The stumpery at Arley was constructed in 1857-8 just after the Gardeners Chronicle article about Biddulph appeared. 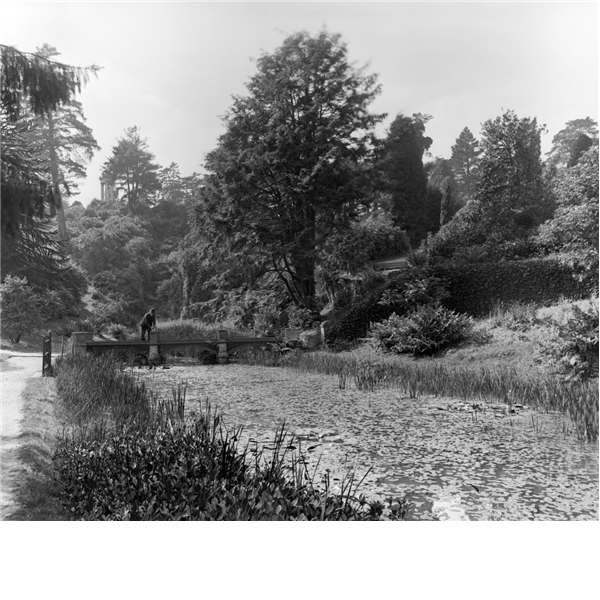 It was known as ‘The Rootree’,and resembled a miniature mountain landscape, complete with hills, rocks, a pool and a secret grotto. When first created it was planted largely with ferns of which Mary assembled a large collection often acquired by raiding the local countryside. Of course Biddulph and Arley started a trend. Nearby Alton Towers soon had a stumpery too. The owner, The 15th Earl of Shrewsbury obviously took an eccentric but still essentially Reptonian view that an eclectic mix of design styles in a garden is no more absurd than filling your house with different kinds of pictures or your bookshelves with different kinds of books. So Alton Towers boasted a pagoda fountain, a Swiss cottage, an Indian Temple and even Stonehenge as well. The stumpery is only mentioned in passing but seems to have been in the valley, and has now disappeared. Another stumpery was built in the 1890s at Dewstow House, near Caldicot in Wales, which is an amazing ‘lost’ but now ‘rediscovered’ garden. 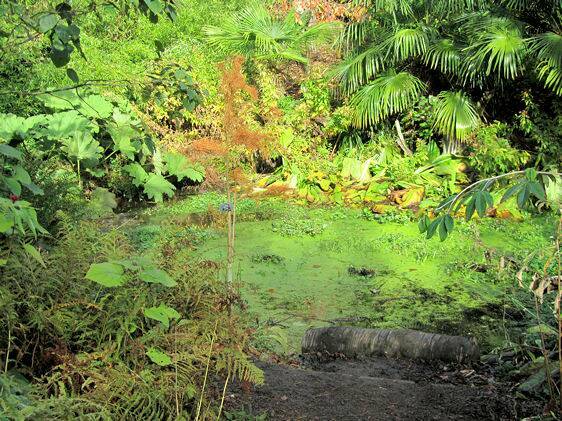 See our database and their website for more information on these ‘very rare and unusual underground gardens’. There’s also a link to a clip of Carole Klein reporting on the restored subterranean fernery for Gardeners’ World [18th May 2012]. One of the other problems of course, is that by their very nature stumperies are relatively transient features with a life expectancy of up to 100 years [Val Bourne, “Rooted in the Past”, The Garden, April 2001]. So it is likely that many more existed but, not being well documented, have simply rotted away and been forgotten. There has been a big revival of interest since Prince Charles decided to confuse his father. 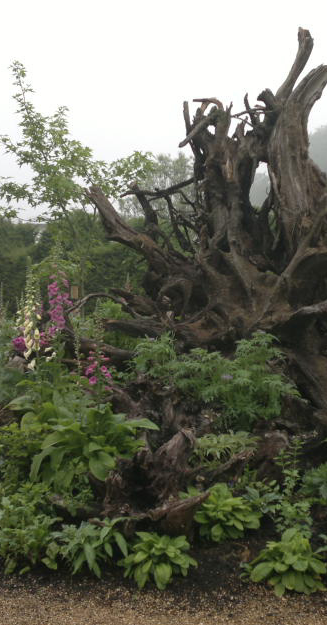 The stumpery at Highgrove is, however, in a different league to anything Wright could ever have envisaged. 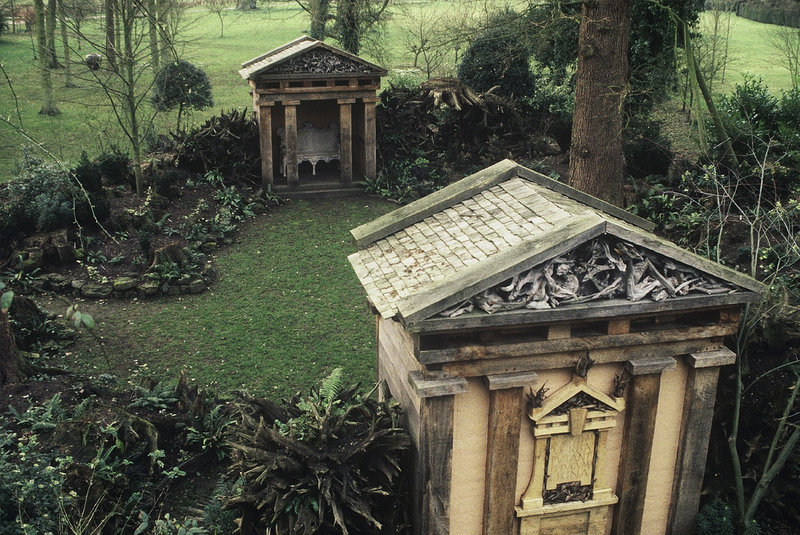 Whereas his rustic designs were to be built of whatever the hermit found at hand, creating the Highgrove stumpery was major logistical exercise. Designed by Julian and Isabel Bannerman it was constructed around 180 sweet chestnut stumps, already old and well weathered, when they were removed from Cowdray Park in Sussex. To add finer detailing [which almost sounds a contradiction in terms] driftwood was brought down from a Scottish reservoir. Two plain oak temples were then built in the classical style provide a contrast. 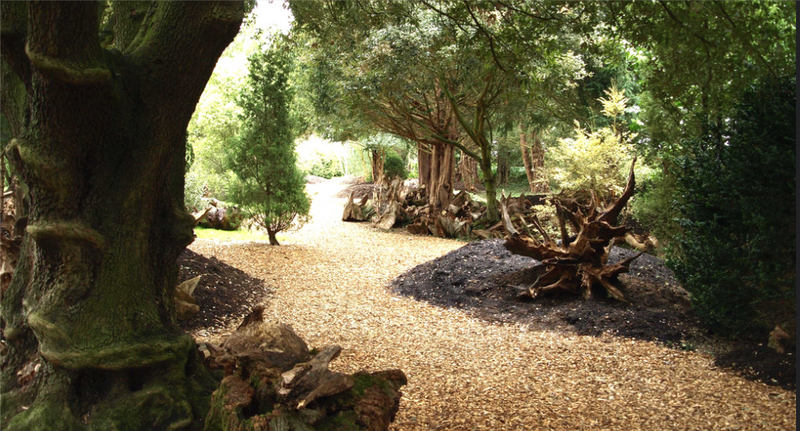 The Bannermans then went on to install their own stumpery in their own garden at Hanham Court. Meanwhile at Ickworth in Suffolk the National Trust garden team are reinstating the stumpery originally made for the Hervey family in the 19th century which even contains some large stones from the Giants’ Causeway. The great storm of 1987 provided the raw material and stumps were part-buried in an area surrounded by yews. The head gardener saying it reminded him of an Arthur Rackham drawing, although so far the stumpery lacked fairy-folk and goblins. It is now being expanded to stretch the whole length of the garden. There are plenty of other modern stumperies too… including those at Ragley, Woolbeding House, Trebah, Dalemain, Arundel Castle, in the arboretum at Castle Howard and at Golders Hill Park on the edge of Hampstead Heath in London. 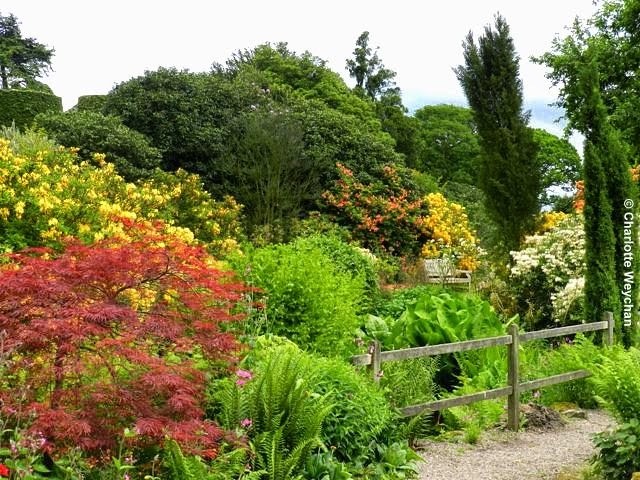 This entry was posted in Uncategorized and tagged arley, Batsford, Biddulph, Dewstow, fernery, ferns, Highgrove, Ickworth, James Bateman, Mrs Earle, William Wright. Bookmark the permalink.